A cardiac stress test is a recording of the heart's activity during exercise. The heart is monitored using electrodes to record its electrical activity. Changes in blood pressure and pulse are measured during the test. Technicians will be alert for any signs of heart or lung problems. Immediate action will be taken if complications happen. A doctor, most often a cardiologist, will be available during the stress test as well. Your medications will be reviewed. Some medications should not be taken before the test. Do not eat or drink products with caffeine for 12-24 hours before the test. Do not eat or drink anything except water for 4 hours before the test. Do not smoke for several hours before the test. Wear comfortable clothing and walking shoes or exercise sneakers. Bring a list of your current medications to the test. If you have diabetes , bring your glucose monitor to the test. ECG electrodes will be attached to your chest. The electrodes are small, sticky patches with wires. Your resting blood pressure and ECG readings will be taken. The cardiac stress test is done on a treadmill or a stationary bike. You will slowly start walking or riding. At regular intervals, the speed and elevation will be increased. Your ECG, blood pressure, heart rate, and symptoms will be closely monitored. The test may be stopped early if you feel extremely tired, get chest pain, have trouble breathing, or if you have any symptoms that suggest heart problems. 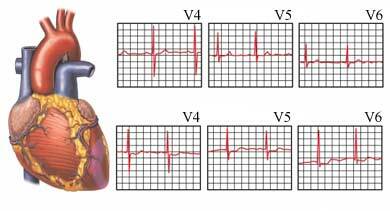 The test will also be stopped if there are significant changes in the ECG. After exercise is complete, your blood pressure, heart rate, and ECG will be monitored until levels return to normal. A blood flow imaging exam may also be ordered. This is called a nuclear stress test. A small amount of radioactive chemical will be injected into a vein when you are exercising at your peak. Scans will be taken while you lie in different positions under a special camera. The images will help identify areas of the heart that may not be receiving enough oxygen. After you have rested for about an hour, a second set of images will be taken. A stress echocardiogram may also be done. This is an ultrasound, which takes pictures of the heart before and right after exercise. You may resume normal activities. The exercise portion of the test generally takes less than 15 minutes. Your entire appointment will last about an hour. A nuclear stress test may take up to 3-4 hours. Exercise testing normally causes no pain. A cardiologist will review the test results and send a report to your doctor. The report is often sent within 24 hours. Your doctor may do more tests to confirm the diagnosis. Talk to your doctor about your results. Cardiac stress testing. EBSCO DynaMed Plus website. Available at: http://www.dynamed.com/topics/dmp~AN~T115175/Cardiac-stress-testing. Updated September 29, 2017. Accessed March 5, 2018. Darrow M. Ordering and understanding the exercise stress test. Am Fam Physician. 1999:59(2):401-410. Exercise stress test. American Heart Association website. Available at: http://www.heart.org/HEARTORG/Conditions/HeartAttack/SymptomsDiagnosisofHeartAttack/Exercise-Stress-Test%5FUCM%5F307474%5FArticle.jsp. Updated September 19, 2016. Accessed March 5, 2018. What is cardiac stress testing? National Heart, Lung, and Blood Institute website. Available at: http://www.nhlbi.nih.gov/health/health-topics/topics/stress. Updated September 19, 2016. Accessed March 5, 2018.